February 4, 2015 (Ulson Gunnar - NEO) Were Hong Kong's street demonstrations a movie, the director's chair would certainly be placed in Washington D.C. Several independent researchers have exposed the shockingly large number of direct links between funding and political backing from Washington and nearly every prominent leader organizing street demonstrations in Hong Kong. 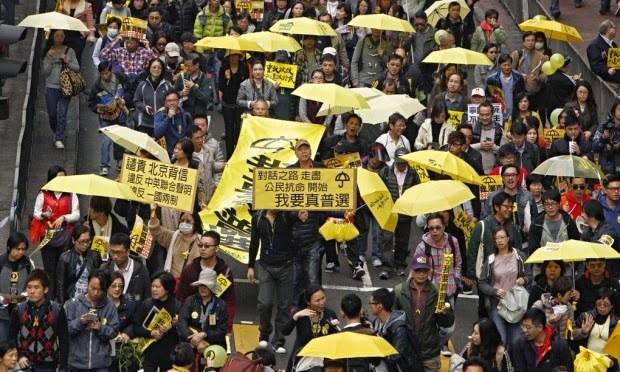 The yellow umbrellas winding through Hong Kong's streets, whose numbers are inflated by American and British media's expert use of tight angles and close ups, could be considered "take two." Take one wasn't fit for Washington's vision for Hong Kong, which is ironic considering the protests claim to be fighting for Hong Kong's self-determination. Regardless, the last round of protests fared poorly, with the majority of Hong Kong's residents turning on protesters who blocked roads for weeks, hurting local businesses and disrupting the lives, peace, and prosperity of the majority. A loud, disruptive minority, disrupting the peace and prosperity of the majority, all while shouting "pro-democratic" slogans presents another irony and one that seems lost on some. The problem for Washington is that its ability to manage public perception has been drastically diminished. This, all while the ability of others, particularly nations targeted by Washington's schemes, now have the ability to bring their side of the story to a larger audience. The balance of power struck means that attempts to portray crooked, clumsy criminals, awkward academics and washed up politicians as another iteration of the global "occupy" phenomenon were destined to fail from the beginning. China in particularly is no longer the plaything of the West. It can defend itself, and it can do so across multiple dimensions from matters of media to those of military. So quickly did Beijing expose and pacify the core premise of the Occupy Central movement, that one wonders why Washington is even trying again. Why Again? Why So Soon? Some might argue that Washington and the troupe of politicians and activists it sponsors have nothing to lose by trying. Several of the movement's leaders are facing increasing legal scrutiny, especially concerning large sums of cash they were moving around during the last round of protests. While success for the protests is a distant, remote possibility, the chances of each leader involved in them in turn self-destructing are much more likely. As time passes, that likelihood only seems to be increasing, leaving Washington and this immense, expensive network it has constructed in perpetual shambles. For Washington, it might be "now or never." But perhaps there is another explanation, and one that security agencies in Beijing should be vigilant regarding, and that is the possibility that the US has somehow managed to formulate a strategy it believes may succeed. Pushing forward a pitiful, already defeated protest through the streets of Hong Kong may be a probing action to help inform precisely how to make its next moves, or it might be to lure Beijing and Hong Kong's local administrators into complacency. The possibility that this otherwise spent force is serving as a diversion for greater unrest or violence planned for elsewhere cannot be discounted. The US currently maintains a variety of "entry points" into China in order to disrupt it. The others being the Tibet Autonomous Region and Xinjiang province in western China. The latter of these two is particularly volatile, with heavily armed, fanatical extremists currently honing their skills in what appears to be a CIA-backed exchange program bringing Chinese terrorists to Syria to fight alongside other US-backed militants, before returning home, bringing with them weapons, cash and extensive battlefield experience (and possibly some new friends). Beijing did two important things during the last round of US-backed protests. First, they categorically dismissed the protesters' demands. Doing anything less would have legitimized the leadership and their agenda. The second important thing Beijing did was then go on to systematically expose the leadership, their ties to foreign interests and improprieties revolving around how they were funding their protests. Beijing's increasingly mature intelligence networks and growing sophistication across mass media greatly helped these efforts where traditional methods would have not only failed, but perhaps even accelerated instability. Together, an insurmountable wall was erected between Washington and its troupe of politicians, activists, and money men, and their goal of not only destabilizing Hong Kong, but helping seed the grounds of the mainland for similar subversion. All Beijing had to do was then wait for the local population to grow tired of the occupations, and by not allowing itself to be provoked into violence. The wait wasn't long. Without incidents to spur on protesters and attract attention from a wider audience, the public was not only inconvenienced by the occupations, but bored as well. By the end of the protests, the people of Hong Kong were begging police to drag Washington's cast of characters and all their extras from the streets. Even some of the protesters themselves appeared relived that the streets were finally being cleared. But what Beijing might also try to do is reach out to those attracted unwittingly to the protests either out of youthful ignorance and curiosity or confusion regarding the actual definition of democracy, and Washington's definition. Alternative avenues for those feeling disenfranchised should be created, ones that lead away from street demonstrations and political contests, and toward more practical means to address their grievances, real or imagined. It is difficult to tell if there will be a "take three," because it all depends on what these recent protests at the beginning of 2015 are truly aimed at achieving. Since achieving political transformation in Hong Kong is all but an impossibility, the only two options that appear to remain are the creation of instability meant to spread to the mainland, or a diversion meant to distract Beijing and tie up resources while a more insidious plot prepares to unfold.